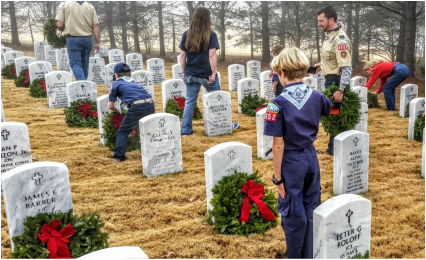 The AT District proudly participates in two annual service projects at the Georgia National Cemetery in Canton. In addition to community service, these events are opportunities for both youth and adults to learn about and appreciate the service and sacrifices of those who have given their lives in service of our country, as well as the rich history of the Canton area. Complete information will not be available until a couple weeks prior to the event per the GA National Cemetery admin. For now, plan on attending the day-of. Parking fills ups fast. Arrive early or be prepared to walk a long distance. Suggested is start arriving after 7:00-am. During the opening program, instructions and a demonstration will be given so that Scouts will know the proper procedure and etiquette for placing the flags, however here are a few tips. Upon hearing Taps at a military ceremony, proper protocol dictates those individuals in scout uniform render a salute until the music is complete while turning and facing the bugler. Civilians should remove their headgear and place their hand over their heart. Please no talking. Scouts should only carry 1 or 2 flags at a time and not a hand full. We take our time and are methodical in protocol and procedure. Place your flag at the tombstone 1 foot back and center . Read the name and tombstone aloud. Salute the tombstone. Remove your cover and say a solo prayer. Only than do we move to the next gravesite. Please assure that all those interested are awarded the opportunity to participate. You might only place 1 or 2 flags as you pay respects. We are short by 2500+ wreaths. If possible please bring a wreath with a red bow to help us cover every grave. Please be at the section you wish to place wreaths at by 10:45 am. There are 7 sections open at this cemetery. Parking is limited so car-pool and allow for extra time to walk from where you park. We will start laying wreaths at Georgia National Cemetery at 11:00 am. Do not place any wreaths until after the section leaders have said the instructions and prayer. Please assure that all those interested are awarded the opportunity to participate. Take only one wreath at a time. After the wreath laying, please work you way to the assembly area near the large flagpole. The ceremony at the assembly area will start promptly at noon. During the 12:00 service we need scouts to hand out water bottles and programs. After the service we need scouts to put up chairs.